Mellany Msengezi Mariri | 4 success habits to think about! 4 success habits to think about! Women are generally hard working and focused, but at times as entrepreneurs we just fail to achieve the financial freedom that we want. We seem to be making money, and the next time you are just so low. They are certain habits that we all need to adopt for total success, and today will touch on a few. My objective is that you launch a successful product but that you are also profitable. There is no point launching great, and making losses to the extent that you close shop again. 1. Are you visible? Really ask yourself, who is seeing your business besides the usual few. Are you scared of becoming visible? A friend of mine last month just said to me, Mel, you are so good at what you do but you just hide yourself! Imagine the shock I had, but when i reviewed myself, I really agreed with her. 2. Are you leaking money in your business? For example your monthly subscriptions that you are not using but are just used to paying i.e TV? Or it could be people who owe you money and you are not getting guts to follow up and demand your money? 3. Do you have a set plan you follow daily, weekly and monthly to generate more and more sales. A marketing plan can help you here. 4. Do you have someone to help you in your business. Remember, you have so much potential but you may not be able to manage family, business and financial accounting all on your own. Slowly grow a team to ensure that you meet your business targets. I want you to be wealthy, healthy and happy. 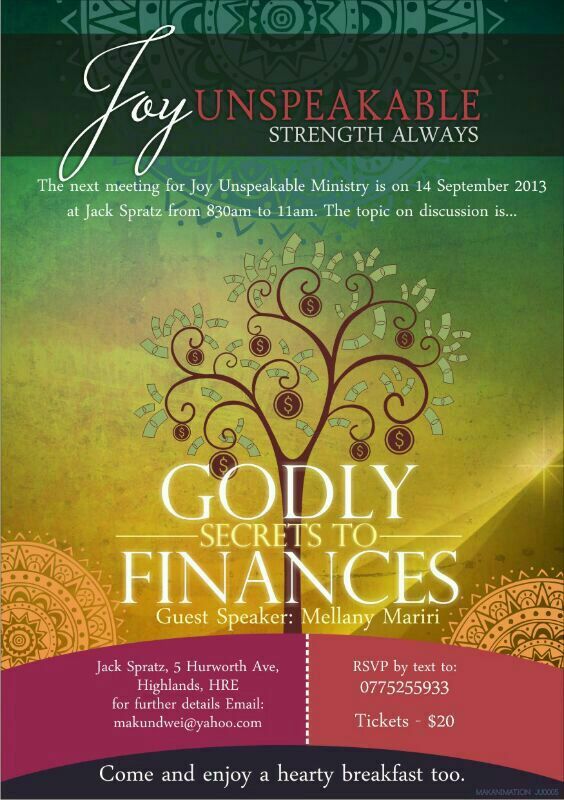 And in light of that, I am inviting you to come for a ladies breakfast meeting at Jack Spratz, 5 Hurworth Ave, Highlands- in Zimbabwe on the 14th of September, 2013 from 8.30am to 11am. The place has beautiful gardens and ambience. The Breakfast meeting is hosted by Joy Unspeakable Ministries. I will be downloading on Secrets to positively changing your cash flow. It is going to be practical, and you will have a networking opportunity with amazing people from all over the city, plus a lovely breakfast and coffee. For booking your seat, please email makundwei@yahoo.com or call on +263 775255933. Tickets are going for $20. Make your payment today via EcoCash to avoid disappointment. Happy Week & Come let’s chat business as women!